An ex-crim and an undercover cop team up to go deep into the bowels of a toxic, walled-off district to retrieve a neutron bomb from the local crime lord, who is aiming it at Paris. Paris 2010 -The Future (don’t argue, just grin and go wash your flying car) – and crime has spiraled out of control, forcing the government to erect unbreachable walls around the worst ghettoes (Districts), where a lawless social system coalesces, run by crime lords. In District 13, do-gooder Leito (David Belle) is in an ongoing battle with the local boss Taha (Bibi Naceri, also the film’s co-writer) and the corrupt police. Outside the District, undercover supercop Damien Tomaso (Cyril Raffaelli) is jet-chopping his way through a gang led by a guy who looks like Gene Simmons with a Ben Franklin hairdo. When Taha gets his hands on a neutron bomb, the French government sends Damien, their best man, to infiltrate District 13, and with the help of Leito on the inside, to retrieve and defuse the bomb. 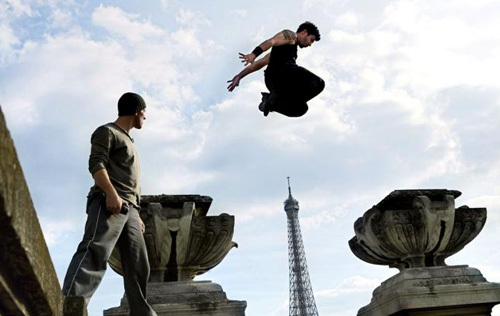 The film takes risks, not just with its unseasoned director, but by basing an action film’s stunts around a relatively new discipline – free running aka Parkour. 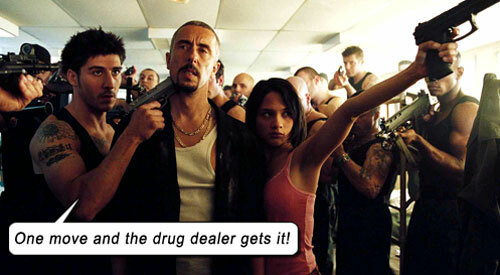 Hiring David Belle for the lead role was another leap of faith, so to speak. As the pioneer who “invented” Parkour, sure Belle could make a good stunt consultant – but could he act? Well, kinda. So his Basic Concerned Faces and Angry Glares will do, as his free-running talent is startling enough to jolt this film into a unique stratosphere, cos that’s really him hoofing it over those battered rooftops and razorwire streets, being chased down by thugs and evading and beating on them creatively, using the angles of his environment as his obstacles and weapons. And Morel captures the panther fluidity and inimitable jetstream of Belle’s incredible innovation. It really is a “new” chase dynamic we are witnessing. (Two years later, James Bond’s CASINO ROYALE would open with a similarly dynamic foot chase, with one of Belle’s contemporaries, Sebastien Foucan.) Although, let’s face it, all the chase scenes and fight scenes in DISTRICT 13 – whether they be on foot or in cars – are predicated on the discrepancy that all the thugs have forgotten they are carrying guns… and if they do think to use them, we realize they’re all graduates of Stormtrooper Training School For Shooting Aimlessly; also, bullets are apparently easily dodged by running in slow motion. Taha aims a rocket at – you guessed it – the Eiffel Tower, for ransom. In a swifty move, Damien gains Taha’s offshore bank codes and drains his accounts. Now, usually when a crime boss’s accounts are drained, their henchmen continue doing their bidding – but here is a cool, very human reaction, “If you have no money, how are you going to pay us?” Uh-oh, time for a retirement party with bullets. It’s gritty, fast and entertaining, interesting twists, black humor and eye-candy action, all accompanied by temple-throbbing modern soundtrack by Bastide Donny, Da Octopuss and Damien Roques. There may be no schools in the Districts, no hospitals, no police force, but damn they got BITCHIN’ cars! Obviously no shortage of mechanics. As to those plot holes: why are all Taha’s thugs firing madly on the car that he is being held hostage in? Your boss is in there, dopes! I also wanted to ask: Why are cops guarding the entrance to District 13? Who’s trying to break into the crime-infested ghetto? And if you are so criminally-minded that you want to traverse the boundary between normal society and sinful society, then the cops should embrace your exit, as it gets you out of their law-abiding abode voluntarily! So Damien’s trying to get in with a bruiser car and a bad attitude – but why are the cops blocking him? Shouldn’t they be more concerned with the crime element trying to break out? And that whole issue of the bomb being on a 24-hour timer – and the defusing/activation of it – makes no sense at all, but you’ll have to unspool that comedy when it kicks you in the chest. These movie politicians thought through their idiotic plot about as efficiently as real life politicians. Jason Bourne and John McClane aren’t the only guys who play rough any more; the new kids in the district play rougher. Music: Bastide Donny, Da Octopuss, Damien Roques. Starring: Cyril Raffaelli, David Belle, Tony D’Amario, Bibi Naceri, Dany Verissimo-Petit, François Chattot, Nicolas Woirion, Patrick Olivier, Samir Guesmi.